How do I subtract one raster from another and extract pixel values for defined locations? Perform a subtraction between two rasters using raster math. 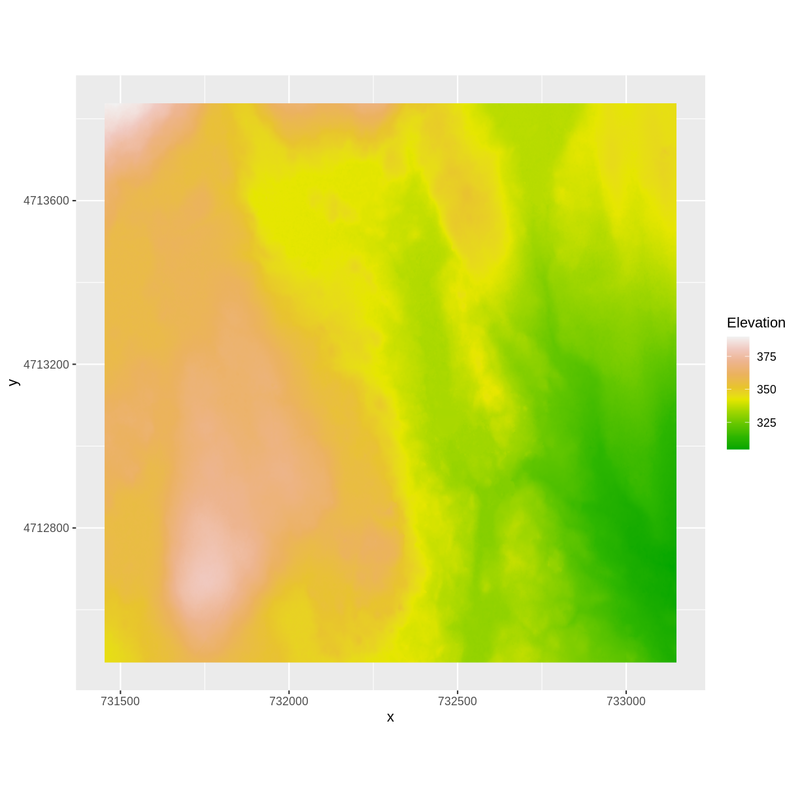 Perform a more efficient subtraction between two rasters using the raster overlay() function. 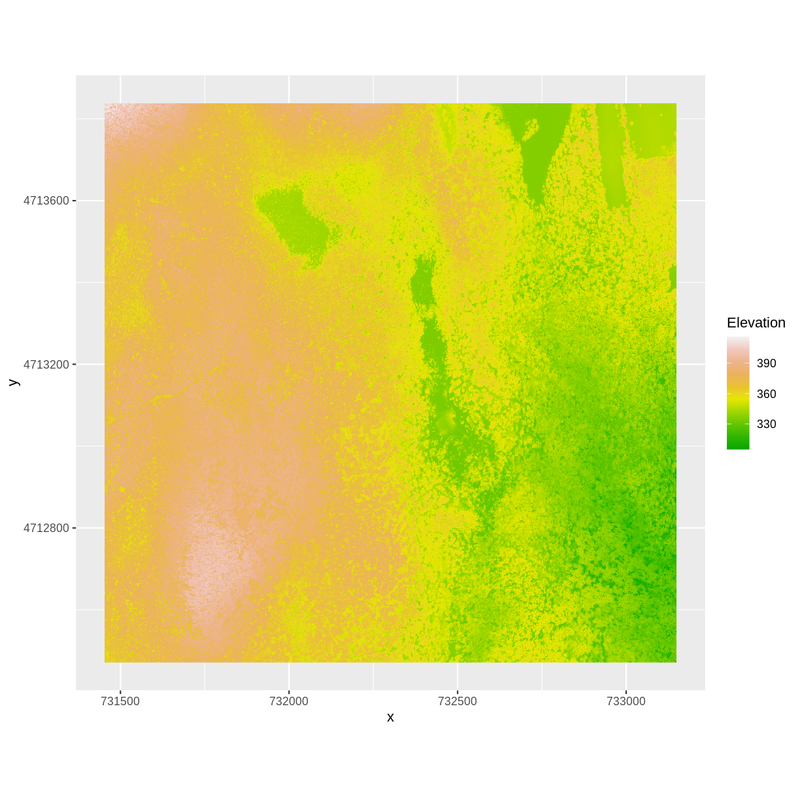 Export raster data as a GeoTIFF file. We often want to combine values of and perform calculations on rasters to create a new output raster. This episode covers how to subtract one raster from another using basic raster math and the overlay() function. It also covers how to extract pixel values from a set of locations - for example a buffer region around plot locations at a field site. We often want to perform calculations on two or more rasters to create a new output raster. 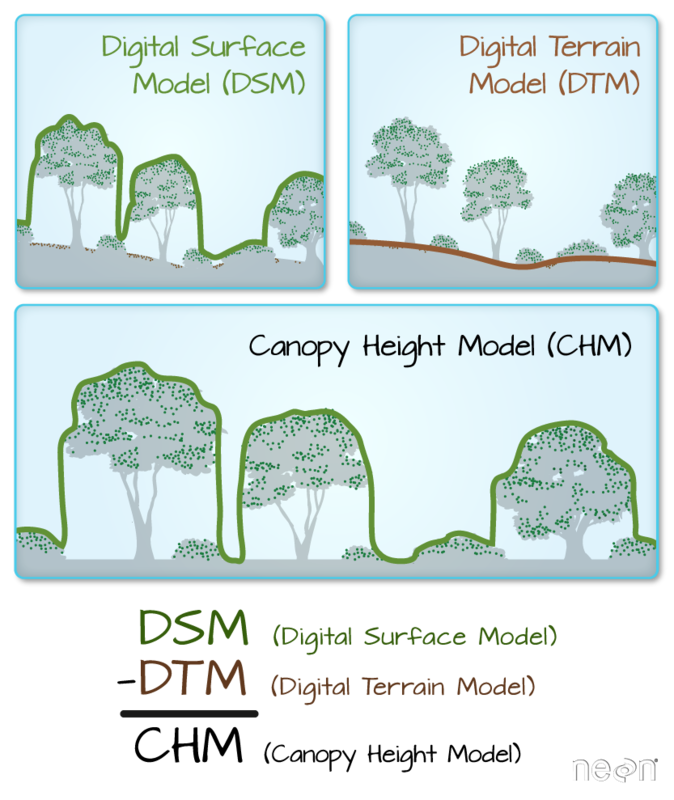 For example, if we are interested in mapping the heights of trees across an entire field site, we might want to calculate the difference between the Digital Surface Model (DSM, tops of trees) and the Digital Terrain Model (DTM, ground level). 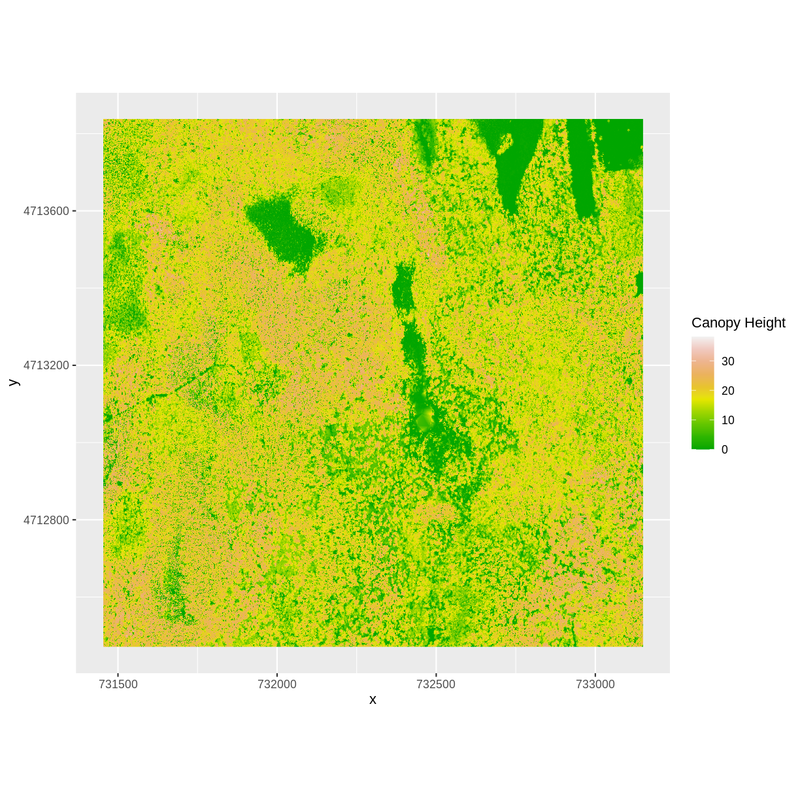 The resulting dataset is referred to as a Canopy Height Model (CHM) and represents the actual height of trees, buildings, etc. with the influence of ground elevation removed. Check out more on LiDAR CHM, DTM and DSM in this NEON Data Skills overview tutorial: What is a CHM, DSM and DTM? About Gridded, Raster LiDAR Data. For this episode, we will use the DTM and DSM from the NEON Harvard Forest Field site and San Joaquin Experimental Range, which we already have loaded from previous episodes. Use the GDALinfo() function to view information about the DTM and DSM data files. Do the two rasters have the same or different CRSs and resolutions? Do they both have defined minimum and maximum values? We can perform raster calculations by subtracting (or adding, multiplying, etc) two rasters. In the geospatial world, we call this “raster math”. Let’s subtract the DTM from the DSM to create a Canopy Height Model. 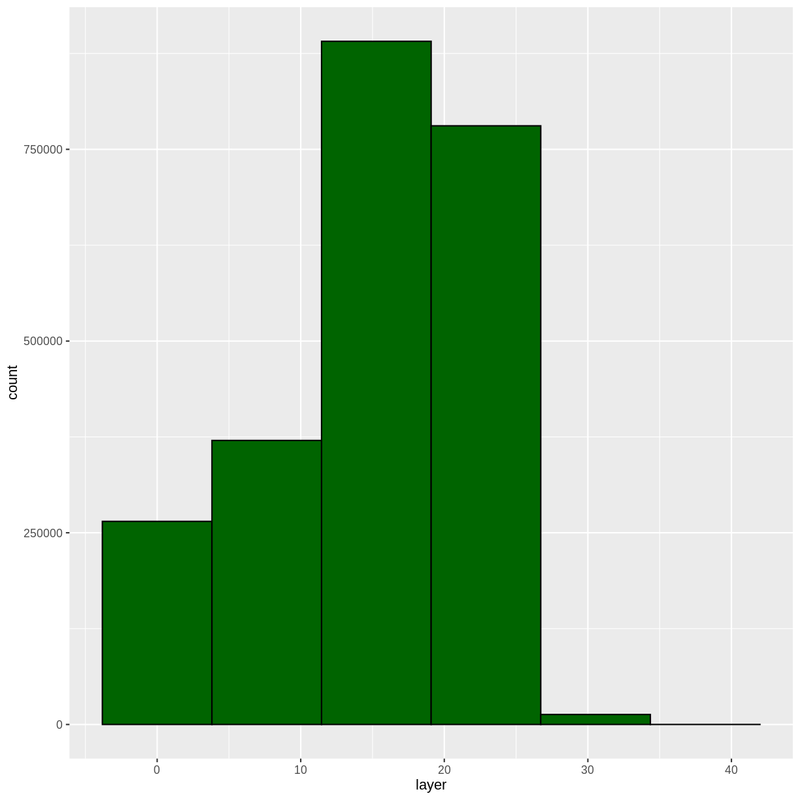 After subtracting, let’s create a dataframe so we can plot with ggplot. We can now plot the output CHM. Let’s have a look at the distribution of values in our newly created Canopy Height Model (CHM). Warning: Removed 1 rows containing non-finite values (stat_bin). Notice that the range of values for the output CHM is between 0 and 30 meters. Does this make sense for trees in Harvard Forest? 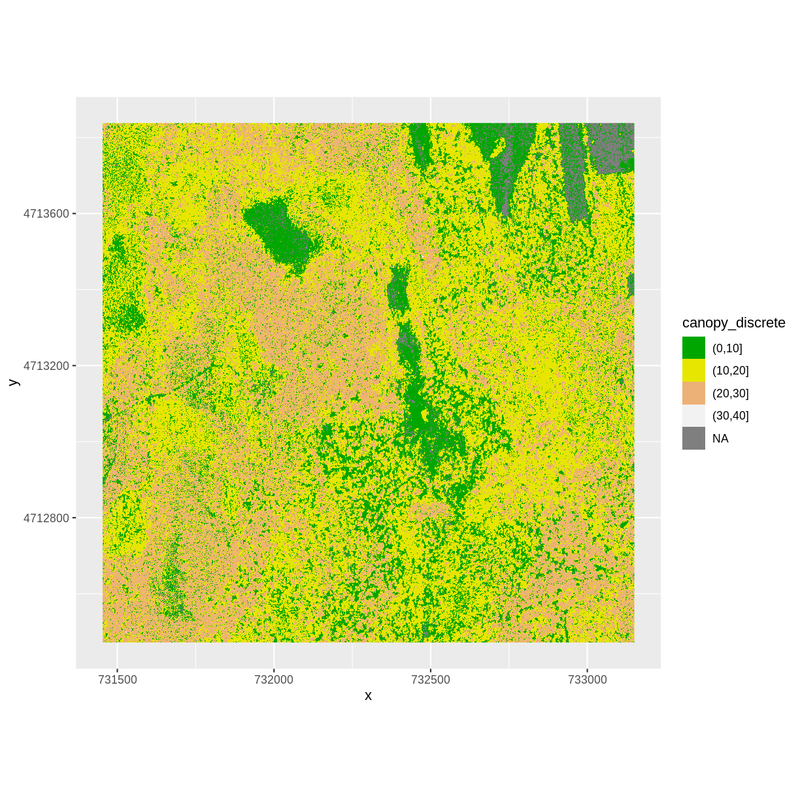 It’s often a good idea to explore the range of values in a raster dataset just like we might explore a dataset that we collected in the field. 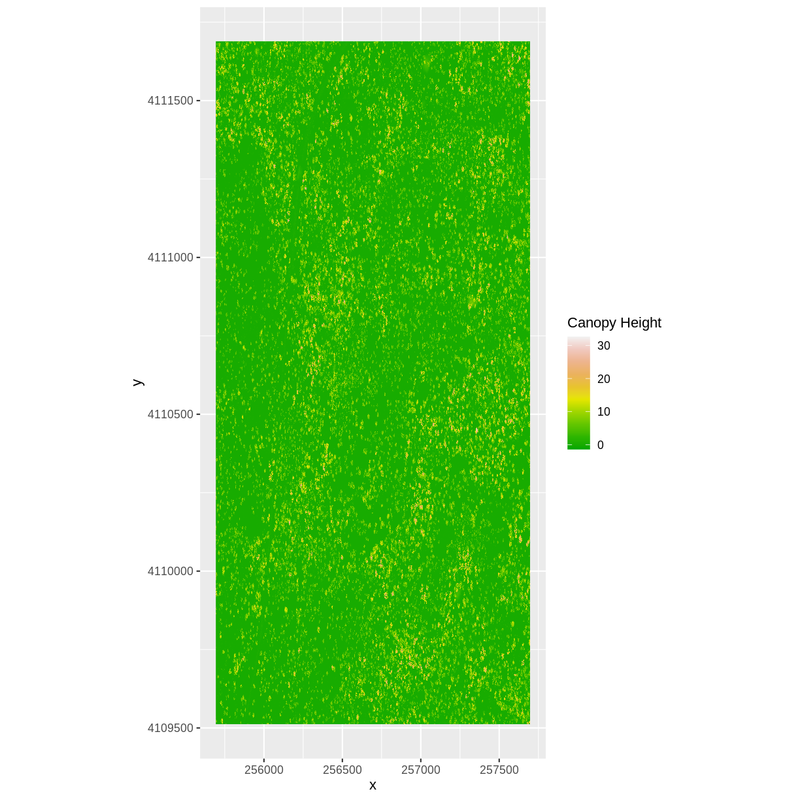 What is the min and maximum value for the Harvard Forest Canopy Height Model (CHM_HARV) that we just created? What are two ways you can check this range of data for CHM_HARV? What is the distribution of all the pixel values in the CHM? 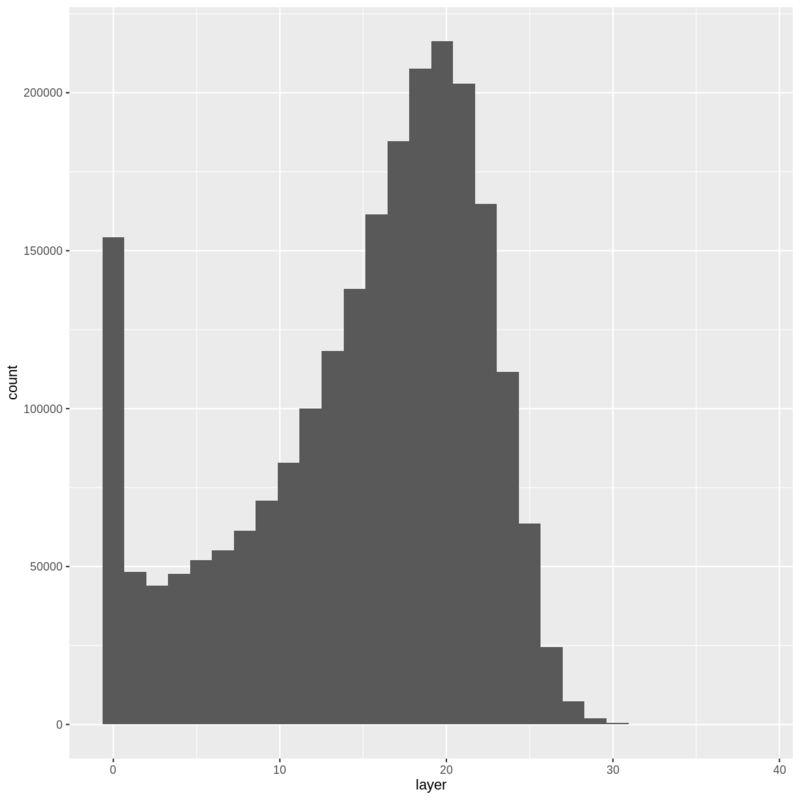 Plot a histogram with 6 bins instead of the default and change the color of the histogram. Plot the CHM_HARV raster using breaks that make sense for the data. Include an appropriate color palette for the data, plot title and no axes ticks / labels. 1) There are missing values in our data, so we need to specify na.rm = TRUE. Use the min() and max() functions. Warning: Removed 51136 rows containing missing values (geom_raster). The rasters we are using are small in size. The calculations we are performing are simple. The rasters we are using are larger in size. The rasters are stored as individual files. The computations performed are complex. If the rasters are stacked and stored as RasterStack or RasterBrick objects in R, then we should use calc(). overlay() will not work on stacked rasters. Let’s perform the same subtraction calculation that we calculated above using raster math, using the overlay() function. 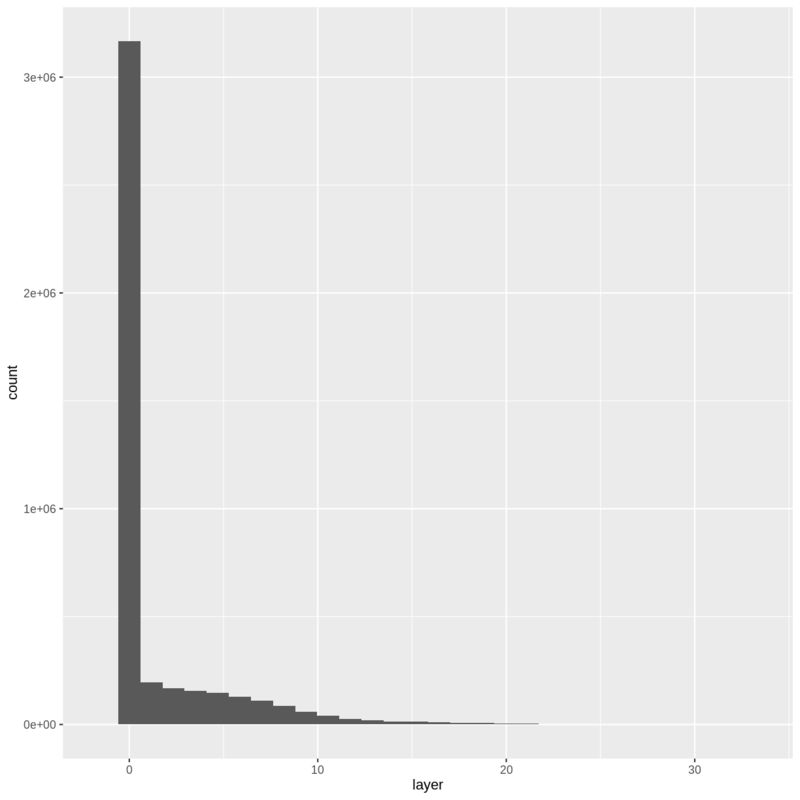 Next we need to convert our new object to a data frame for plotting with ggplot. How do the plots of the CHM created with manual raster math and the overlay() function compare? Now that we’ve created a new raster, let’s export the data as a GeoTIFF file using the writeRaster() function. When we write this raster object to a GeoTIFF file we’ll name it CHM_HARV.tiff. This name allows us to quickly remember both what the data contains (CHM data) and for where (HARVard Forest). The writeRaster() function by default writes the output file to your working directory unless you specify a full file path. We will specify the output format (“GTiff”), the no data value (NAflag = -9999. We will also tell R to overwrite any data that is already in a file of the same name. format: specify that the format will be GTiff or GeoTIFF. overwrite: If TRUE, R will overwrite any existing file with the same name in the specified directory. USE THIS SETTING WITH CAUTION! NAflag: set the GeoTIFF tag for NoDataValue to -9999, the National Ecological Observatory Network’s (NEON) standard NoDataValue. Data are often more interesting and powerful when we compare them across various locations. Let’s compare some data collected over Harvard Forest to data collected in Southern California. The NEON San Joaquin Experimental Range (SJER) field site located in Southern California has a very different ecosystem and climate than the NEON Harvard Forest Field Site in Massachusetts. Import the SJER DSM and DTM raster files and create a Canopy Height Model. Then compare the two sites. Be sure to name your R objects and outputs carefully, as follows: objectType_SJER (e.g. DSM_SJER). This will help you keep track of data from different sites! You should have the DSM and DTM data for the SJER site already loaded from the Plot Raster Data in R episode.) Don’t forget to check the CRSs and units of the data. Create a CHM from the two raster layers and check to make sure the data are what you expect. Plot the CHM from SJER. Export the SJER CHM as a GeoTIFF. Compare the vegetation structure of the Harvard Forest and San Joaquin Experimental Range. 1) Use the overlay() function to subtract the two rasters & create the CHM. 4) Compare the SJER and HARV CHMs. Tree heights are much shorter in SJER. You can confirm this by looking at the histograms of the two CHMs.